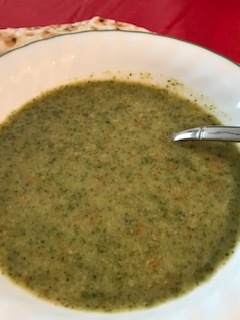 To get you into the spirit of a new year, I felt it appropriate to re-post two traditional Armenian recipes: Anoush Abour (literally meaning 'sweet soup') and Daree Hats ('year bread'). 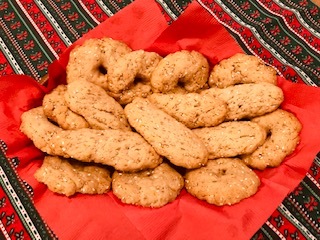 Savor the arrival of the New Year and Armenian Christmas with your loved ones with these sweet, fruity, nutty delicacies. Shnorhavor Nor Daree yev Soorp Dzuhnoont! 5. Pomegranate seeds could either be incorporated into pudding uncooked or served separately as a garnish. #2. 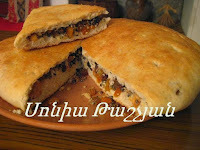 The Daree Hats (pronounced ‘da-ree hots’) recipe is from my friend in Yerevan, Sonia Tashjian. 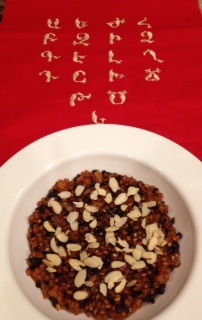 In addition to the recipe, Sonia provided some background information so you can appreciate its meaning. 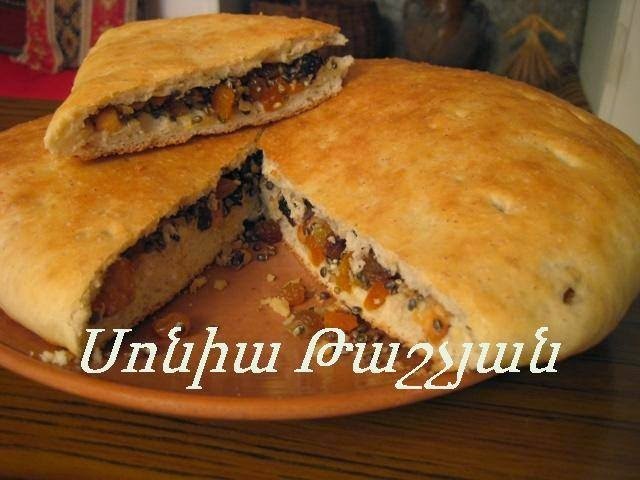 "Daree Hats is an Armenian traditional bread prepared for the New Year and is served on New Year's Eve. When the family gathers around the holiday table, the grandmother cuts the bread and serves it to the members of the family. The family member who receives the portion of bread with the coin, is granted good luck and fertility during the coming year. The tradition of Daree Hats (other names are Dari, Grgene, Kloj, etc...) began centuries ago. In the springtime, the first man prepared the bread using the last of the dried fruits and decorated the bread with seeds. The bread was dedicated to his gods in the hope of a fertile crop for the coming year." • Mix flour, baking powder, sugar, and cinnamon (if using). Add the oil and hot water; mix well. • Add the dried fruit, raisins, and chopped nuts. 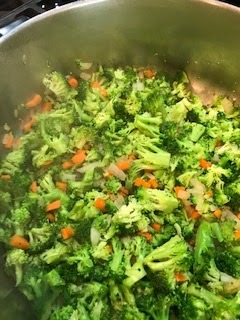 Mix, then place in a non-stick round pan. • Wrap the coin with foil, then insert it into the dough. Rub water on the surface of the dough and sprinkle linseed or sesame seeds on top. • Preheat the oven at medium temperature (approx. 350° F) and bake 40-45 minutes. I must admit that I’ve never eaten a persimmon. As I’d walk to class at Chico State (CA) back in 1969-70, I’d see numerous persimmon trees which studded front yards of homes near the campus. I was curious about the fruit hanging from those trees, but not curious-enough to taste one. 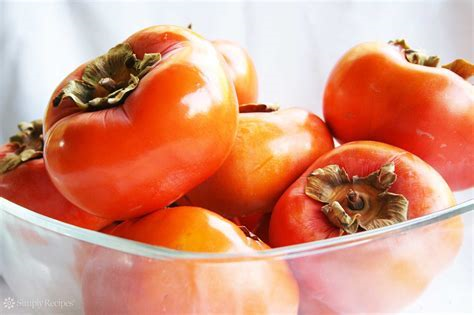 Persimmons - they look like tomatoes, but they're not! My loss. According to Sheri Castle, writer, recipe developer, cooking teacher, and public speaker, “the silky pulp of persimmons tastes like a patchwork of fresh apricot, dried peach, guava jam, roasted pumpkin, and a speck of spice or nuts.” Who could resist something that sounds so luscious? New Year’s resolution is this: The next time I come across a persimmon tree or at least a persimmon in the store, I promised to myself to try one! Fortunately, Mrs. Alice Vartanian, mother of my friend Christine Vartanian-Datian, knows about persimmons and offers us her recipe for Persimmon Walnut Raisin Cookies. Preheat oven to 350 degrees. Lightly grease two baking sheets and set aside. In large bowl, cream the sugar and the shortening until fluffy. Add the egg and mix to combine. 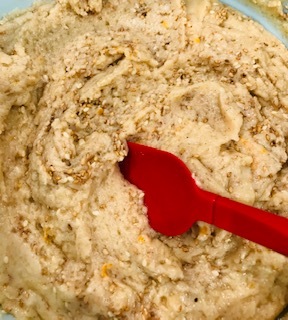 Add the flour, baking soda, vanilla, cinnamon, salt, zest, cloves, nutmeg, and ginger, and mix to combine. Add the persimmon puree, nuts, raisins (or dates), and chocolate chips, if desired. 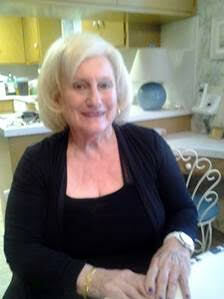 Drop by the rounded spoonful on baking sheet and bake until cookie top springs back when touched, for 12 to 14 minutes. Remove cookies from oven and cool on baking sheet for 5 minutes before transferring to a wire rack to cool completely. Also, once cooled, dip half the cookie in melted dark or white chocolate and sprinkle with chopped nuts. Dried cranberries, dried cherries, chopped pecans or almonds may be added to this recipe. Or use 2 teaspoons of pumpkin pie spice to replace the cinnamon, cloves, nutmeg and ginger for this recipe. Cookies may be glazed with orange or lemon glaze, if desired. As Doug and I continue to explore Charlotte, NC and the surrounding around, we tend to seek-out Greek and Middle Eastern stores and establishments (meaning restaurants). We stumbled upon a rather small Greek store called the Agora Greek Market on the east side of Charlotte which offers lots of goodies – spices, sweets, oils, cheeses, even family-sized packages of frozen pastitsio, moussaka, and baklava! 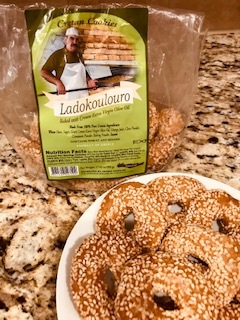 We purchased a few items including a bag of Greek sesame seed-olive oil cookies called Ladokoulouro, a product of Crete. Once home, it was imperative that we sample the cookies right away. I put on a pot of coffee and opened the bag of cookies. We found them to be not too sweet – which we liked, with a gentle hint of cinnamon and cloves, and a pleasing crunch – just right for dunking into our coffee. Since the Agora is a bit far from home and we won’t be going that way too often, I thought it wise to find a recipe for Ladokoulouro to make at home. 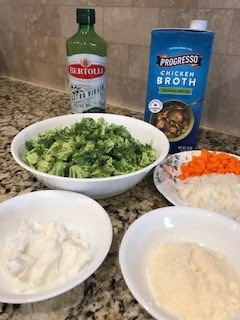 I searched several recipes online and pieced one together that made sense to me. Preheat the oven to 375° degrees F.
Zest an orange before juicing; set aside until ready to use. In a large bowl, whisk together 4 cups of the flour, baking soda, baking powder, salt, cinnamon and cloves until blended. 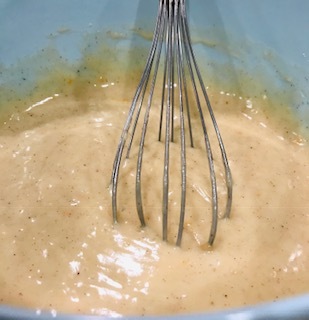 In another bowl, whisk together the olive oil, orange juice, water, orange zest, sugar, vanilla and cognac (if using) until well- incorporated. 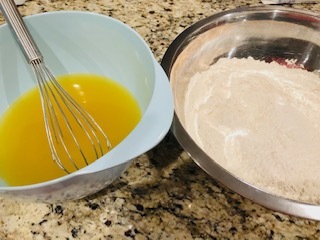 Add the flour mixture a little at a time stirring with a wire whisk to combine. At this time you may add additional flour, but not more than 5 cups total. If the mixture becomes too thick to mix with the whisk, use your hands to combine. The dough may appear to be quite sticky to this point; don’t panic! Set it aside for 10 minutes or so. You’ll find that the dough will become quite workable. 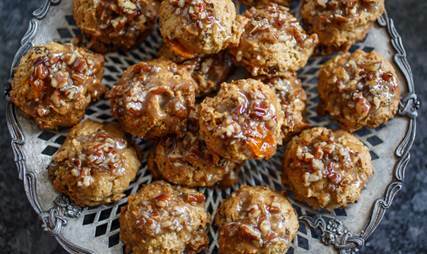 Pinch-off walnut-sized balls of dough. Roll the balls into 4-inch logs and placing them on a parchment-lined baking pan. 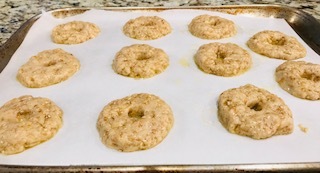 You can also create a doughnut-shaped cookie by taking the walnut-sized ball, placing it on the parchment-lined baking sheet, flattening it, and making a hole in the center with your finger. Personally, I liked the doughnut-shaped cookies better than the logs. They came out crispier - just the way I like it! Be sure to leave some room in between each cookie on the baking pan to allow for expansion. 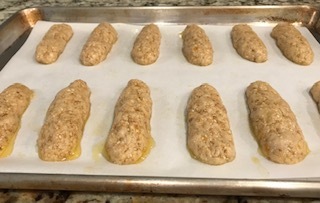 Bake in the preheated oven for about 25 minutes or until the cookies become slightly browned around the edges and top. NOTE: If baking more than one tray of cookies at a time, rotate the trays halfway through the baking time by switching the bottom tray to the upper rack and the top tray on the bottom. This will ensure even baking. Place the cookies on wire racks to cool completely.